Les Kiss’ men ran in seven tries to move up to fourth. Bowe enjoyed a happy return. ULSTER BOOSTED THEIR Pro12 play-offs hopes with an emphatic seven-try victory over Zebre in Italy this afternoon. It took the northern province just two minutes to seize control of the game and they never looked back, running in seven times to move into fourth place in the Pro12. Jared Payne scored a hat-trick while Tommy Bowe marked his first appearance of the season with a brace at the Stadio Sergio Lanfranchi. Ruan Pienaar and Craig Gilroy were the other try-scorers as Les Kiss’ men strolled to five points under the Italian sun. They leapfrog Scarlets into the final play-off berth with just two games remaining. Leinster are the visitors to Belfast in a fortnight before a trip to the Liberty Stadium rounds off the regular season. After facing an extended period on the sidelines, Bowe wasted little time in getting back on the scoresheet as he dotted down after 12 minutes to restore Ulster’s lead after Pienaar’s opening score had been cancelled out. But that was as close as the hosts got as Gilroy and then Payne ensured Ulster secured the bonus point before the break and the scoring continued after as the latter completed his hat-trick. Bowe had the final say with his second of the day in the closing stages to seal an emphatic, and important, victory on the road. Email “Tommy Bowe marks first appearance of season with brace as Ulster record big victory in Italy ”. 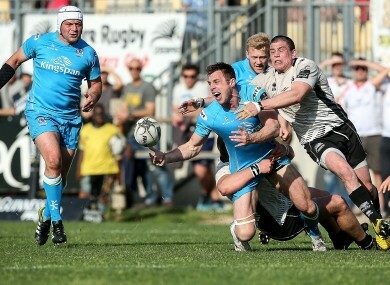 Feedback on “Tommy Bowe marks first appearance of season with brace as Ulster record big victory in Italy ”.